Click For More Info 2005 - 2015 TACOMA BASE ALL ALL ALL ALL ALL 4WD;For Rear Lifted Height: 0-1.5"
Click For More Info 2005 - 2015 TACOMA PRE RUNNER ALL ALL ALL ALL ALL For Rear Lifted Height: 0-1.5"
Click For More Info 2015 - 2017 TACOMA TRD PRO ALL ALL ALL ALL ALL For Rear Lifted Height: 0-1.5"
Click For More Info 2016 - 2017 TACOMA LIMITED ALL ALL ALL ALL ALL For Rear Lifted Height: 0-1.5"
Click For More Info 2016 - 2017 TACOMA SR ALL ALL ALL ALL ALL For Rear Lifted Height: 0-1.5"
Click For More Info 2016 - 2017 TACOMA SR5 ALL ALL ALL ALL ALL For Rear Lifted Height: 0-1.5"
Click For More Info 2016 - 2017 TACOMA TRD OFF-ROAD ALL ALL ALL ALL ALL For Rear Lifted Height: 0-1.5"
Click For More Info 2016 - 2017 TACOMA TRD SPORT ALL ALL ALL ALL ALL For Rear Lifted Height: 0-1.5"
BILSTEIN B8 8100 (Bypass) is a direct fit, position sensitive, damper for light trucks and SUVs. These motorsports inspired shock absorbers utilize a dual tube externally adjustable bypass design. B8 8100 (Bypass) feature Incremental Flow bypass adjusters, allowing for finite and incremental changes for rebound and compression. 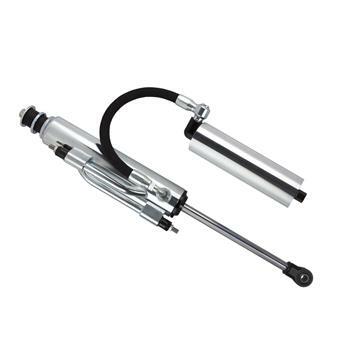 The shocks utilize a bottom hose, remote reservoir exit port, delivering increased compression control during the full cycle. The remote reservoir is supplied with a bolt-on aluminum anodized chassis mount for an easy fitment. BILSTEIN B8 8100 (Bypass) will maximize the driver experience, offering unparalleled ride comfort and incredible bottom out control.